The TallyGenicom 6815 line printer prints up to 1500 lines per minute. The enclosed cabinet model reduces noise, making it ideal for office and warehouses. Print mission-critical applications fast. This industrial-strength printer is ideal for noise-adverse areas running large, unattended print applications. Its genius lies in its design. TallyGenicom configured the TallyGenicom 6815 line printer to operate in a sturdy, fully enclosed sound-reduction cabinet. Adaptable Functionality. 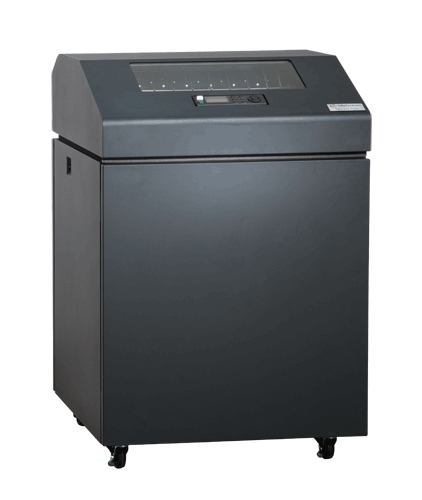 The 6815 line printer adapts to almost any supply-chain or back-office environment. PowerPrint™ delivers improved print clarity and print darkness on multi-part forms by increasing impact energy. PowerPrint is a standard feature on TallyGenicom 6815 printers with a 1,000 line-per- minute print speed. Manageable Savings. The TallyGenicom 6815 is a smart purchase.